After months of trying to shore up Brazil's public finances, President Dilma Rousseff now faces political and business pressure to ease up on painful austerity measures in a country long hooked on the helping hand of a big state. Business leaders have supported the beleaguered Rousseff as she faces growing calls from political foes for her resignation or impeachment, but some are growing impatient with austerity policies that are beginning to bite into their profits. "The government's focus is completely wrong. It should be cutting its own payroll instead of investments that boost the economy," said Jose Carlos Martins, the head of Brazil's construction industry lobby. Cutbacks in public infrastructure programs are expected to cost the construction industry 500,000 jobs this year, or about a sixth of its total workforce, he said. As Brazil sinks into a deep recession, no one wants to bite the bullet, even if they know the government needs to spend less. It raises the risk that Brazil will lose its hard-won investment grade credit rating. Rousseff's leftist Workers' Party and labor unions are calling on corporate Brazil to shoulder some of the burden before belt-tightening squeezes social programs that lifted millions from poverty. "It was easy to give businesses indecent tax breaks. Now they don't want to start paying again," said Workers' Party Senator Paolo Paim, a steelworker turned politician. "We must get real and get tough on tax collection." Manufacturing companies complain their payroll tax bill will double in some cases after the government recently rolled back tax breaks and reduced a refund of taxes on exported goods. "The higher taxes have reduced the money circulating in the economy and consumers are buying less," said Marcio Utsch, chief executive of shoemaker Alpargatas SA, the manufacturer of Havaianas flip-flops. The head of Sao Paulo's powerful Industrial Confederation, Paulo Skaf, has warned that Finance Minister Joaquim Levy's fiscal adjustment is destroying jobs. "If the finance minister can't fix the Brazilian economy without raising taxes, he should pack his bags and go," Skaf said when Levy recently proposed reinstating a financial transactions tax. "If he continues like this, he will become the minister of unemployment." To ease the backlash, Rousseff has already started to loosen the purse strings. Last month, she ordered state-run lenders to offer 8 billion Brazilian reais ($2.1 billion) in cheap credit lines to Brazil's struggling auto sector. On Friday, Rousseff promised to make no further cuts to social welfare programs and said she will maintain plans to expand low-cost housing by 3 million units through 2018. Even when her government isn't putting the brakes on austerity, Congress can do it. 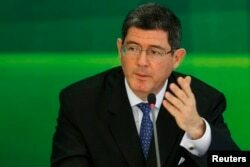 FILE - Brazil's incoming finance minister, banker Joaquim Levy gestures during a news conference in Brasilia, Nov. 27, 2014. Lawmakers watered down measures devised by Levy to reduce spending by cutting pension and unemployment benefits. They also voted for spending bills that included a hefty pay hike for public employees. The fiscal indiscipline has frustrated Levy, who also opposed sending Congress a budget with an unprecedented 0.34 percent primary deficit last week instead of a 0.7 percent surplus planned earlier. The decision starkly raised the risk of credit agencies downgrading Brazilian bonds to junk level as early as next year. Sources in the government said Levy's insistence on cutting deeper into public spending is meeting stiff resistance. "Rousseff has yielded to some interests and that has raised tensions inside the administration," said a government official close to policy discussions. "It is natural that the finance minister will grow more isolated at a time of recession." Levy, a University of Chicago-trained economist and former banking executive, has lost ground to Planning Minister Nelson Barbosa and Rousseff's chief of staff, Aloizio Mercadante. Both are leftist economists who share the president's natural wariness over austerity measures and support a more moderate adjustment that does not suffocate the economy and undermine social programs. Rousseff needs Levy to convince investors she is serious about putting finances in order. Fears that he could quit helped drag Brazil's real to 13-year lows last week when he failed to obtain more belt-tightening in the 2016 budget. Rousseff has not ruled out more taxes to bridge a 30.5-billion real shortfall next year and she will look at ways to cut obligatory government expenditures, which make up about 90 percent of the budget. One plan is to cut 10 of Brasilia's 39 government ministries and sell off state properties. That looks good on paper, but officials acknowledge it would bring in no more than 1 billion reais or 3 percent of next year's projected primary deficit. Conservative opposition lawmakers and many members of allied parties in Rousseff's coalition refuse to approve new taxes unless they are accompanied by deep cuts in spending. Years of heavy spending on bulging payrolls and pensions afforded by a paternalistic state that has stoked the economy with subsidized credit make it extremely difficult to cut back without hurting key interests. At the heart of Brazil's fiscal crisis lies the explosive growth of social handouts that lifted millions from poverty. Their cost has ballooned by 220 percent over the last decade and today account for half of overall expenditures prior to debt payments, congressional budget consultants say. Among the programs most likely to get cut first are monthly cash transfers to families of prison inmates and payments to fishermen when fishing is out of season. But Rousseff is reluctant to extend cuts to the most popular programs, which have helped keep her party in power since 2003. "For a weak government in a recession, it is very difficult to remove social benefits," said Welber Barral, a business consultant in Brasilia. "Taking them away means losing what little political support she still has."